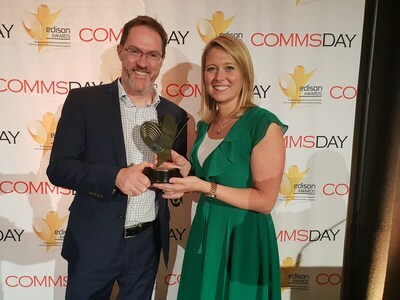 SYDNEY, April 9, 2019 /PRNewswire/ -- NetComm has won the highly prestigious Commsday 2019 Edison Award for Best Telecom Marketing Initiative for our 5G Fixed Wireless Self-install campaign launched at Mobile World Congress in Barcelona earlier this year. Beating off competition from other nominees including SingTel backed Optus, Superloop and Aussie Broadband the Edison Award judges gave NetComm the hotly contested award due to the excellence of our campaign in delivering global awareness amongst network operators of the 5G Fixed Wireless Self-install product. On the back of the initial 5G Fixed Wireless Self-install campaign that launched on January 30th NetComm was able to generate substantial operator, media and analyst interest in our 5G Fixed Wireless Self-install product despite the highly competitive media market leading into Mobile World Congress. "We are absolutely thrilled and very honoured to win this Commsday Edison Award 2019 for Best Telecom Marketing Initiative for our 5G Fixed Wireless Self-Install campaign. "NetComm is extremely proud of the fact that we managed to create a hugely successful campaign that delivered fantastic results in driving awareness of our ground-breaking 5G Fixed Wireless Self-install campaign. "Launching new products around Mobile World Congress is a challenge because there is so much going on in the market place so we had to create a campaign that would cut through all that. "The results speak for themselves and on the back of our campaign NetComm had our most successful Mobile World Congress ever and was receiving interest from operators and analysts all around the world in our 5G Fixed Wireless Self-install product. "Up until now NetComm has been one of the best kept secrets in the global telecoms industry, but now the secret is well and truly out for good." Picture: Steve Collins, NetComm Interim CEO and Els Baert, NetComm Director of Marketing & Communications.